Howdy-do!! I was all set with every intention to blog about my fab idea for making cute and inexpensive window coverings. But, I have not made it to the discount store to buy the materials. It is definitely on my 'list'. I will take pictures and post about it soon!! So instead I am going to share some ideas about homework. Homework in July? As I prepare for my new group of students coming next year, new math curriculum, and a new co-teacher (who I am so super excited) to work with, I keep thinking about how I want to manage Kindergarten Homework. I have a few thoughts on homework and I wanted to share how I currently manage it with my students. I am a Kindergarten Intervention Specialist. I work with my students in the resource classroom and in their regular education classrooms. They cut an Intervention Specialist at our building for the Fall ( well luckily she got moved to another building and NOT cut) so I am starting with 11 students. In our district, that is a big case load. Do you have your kinders complete homework? How often do you send it home? Weekly? Monthly? I send my homework packets home every Monday. I also send reminder notes home in the student's Communication Notebooks (they ALL have one, and they are sent home daily to be read, signed and returned). But, what about the students who do not return the packets? In my classroom the students earn stickers on a motivation chart. When they earn 5 stickers they can visit the 'treasure' box and pick something to keep. They also receive a certificate each week. The children who do not have their homework are always upset they do not have it completed. For my students who do not return their packet, no problem!! I have a homework center in my classroom. I feel that the concept of completing homework is important, it teaches responsibility. That said, it is really the parent's responsibility to complete it with their child and I feel strongly that the child should not be punished for it not being returned. I begin my homework the 3rd week of school, after the children have settled into school a bit. The activities are quick and fun, aligned with the Common Core. However, one of the best components of having homework is that it reduced 'surprises' with the parents. Parents who complete the homework packets are always more 'in the loop' with their child's learning level. I love your blog and ideas!! I just awarded you the Versatile Blog Award. Head on over to my blog to get your award! Thanks so much Crystal! I appreciate you thinking of me. I love the fact that you allow the kids to complete their homework in the morning at school if they have to. Little kids aren't good at managing their time, and they REALLY need a grown-up to say, "It's homework time!" and maybe help them with it. Sadly, a lot of parents do not bother, or don't have the time. I completely agree Angel!!! By letting them complete it at school they are still learning that 'hey, this is important', and my homework activities are fun so there are never any 'groans' about going to the homework center. I have nominated you for the Versatile Blogger Award. Please stop by my blog to pick it up. Just found your blog and love it! Just became a follower. I love your homework ideas! For our grade we used to send home a cover sheet on Monday and then each day put the worksheets in the folders. I found it was becoming hard to keep up with and the parents/children sometimes had a lot of after school activities and became stressed over not being able to complete their homework on time. This year I changed our homework to packets. 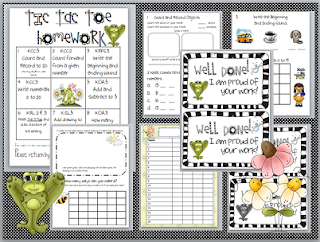 Its much easier to keep track of the work plus it gives the parents a bit of leeway in terms of when they have to complete the work.